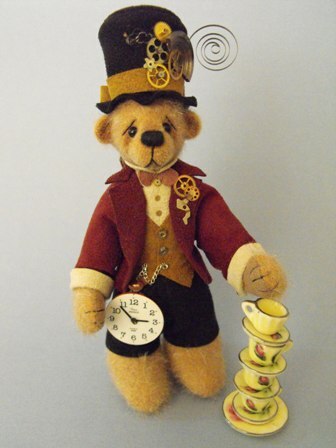 Parker Bears - Hand Made Miniature Artist Bears from Downunder: The time has come!! The time has come my Blogging Friends to talk of other things.. of Tea and Cake and Teddy Bears.. Of Party dresses and Wings. Meet "Hatter" my Preview bear for the show. He is 4" short without his hat and 5" with. The show Preview is now open where you can view one Bear from each participating Artist and vote for your favourite in each category. Click on the Banner in my sidebar and you will be taken straight there. Lyn, Hatter is so special. I hope he does well. Just gorgeous Lyn!! Can't wait to see the others!! Love your creations!! !